Vibrant, Easy Paleo Sprinkles - Oh, The Things We'll Make! These easy paleo sprinkles have very vibrant colors and are made with natural ingredients that you likely already have sitting around your kitchen. Last year for Easter you may recall that I made some paleo marshmallow peeps. At first I tried making them truer to the originals by making some not-so-paleo naturally colored sugar sprinkles. 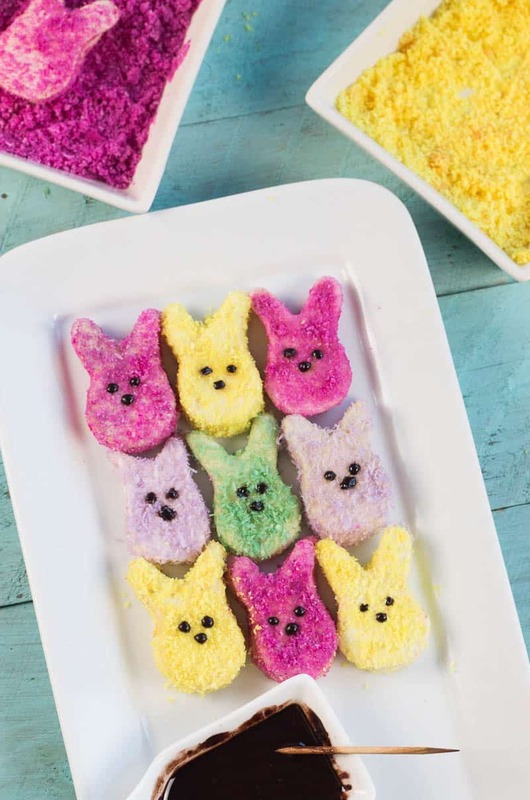 I ditched those for these coconut paleo sprinkles after seeing how much better they held up, how vibrant the colors were, and how much better the peeps tasted when covered with them. When I made the peeps, I put my paleo sprinkles in small jars so that I could take pictures of them, and later hid them away in a drawer where I forgot about them until now. I, instead, decided to spread a little bit of maple syrup on mine and then remembered my paleo sprinkles. You may wonder why I had set aside the paleo sprinkles for so long. When I was working on making natural food colorings, I was looking for ways to make them somewhat shelf stable. My homemade naturally colored sugar crystals lost their color after a few weeks, but my coconut sprinkles still seemed pretty vibrant. I wanted to test them out to see if the coloring in my sprinkles would stay vibrant and if the coconut would keep once tinted. I didn't want to risk using them up before testing them out, so I hid them away in the back of a drawer that is otherwise filled with photography props and lens cleaners. Once hidden away, not only did I not eat them, but I completely forgot about them until I wanted sprinkles for my homemade pop tarts the other day. I was excited to see that the colors of the yellow turmeric sprinkles and pink beetroot sprinkles were still pretty vibrant after more than 10 months had passed, but they did lose some intensity. The purple sprinkles had faded more, and the green sprinkles no longer were very green at all, but I was super happy with how the yellow and pink sprinkles had held up. I opened all of them up and they seemed to smell and taste OK.
That's what made me look into the normal shelf life of dessicated shredded coconut. It turns out that most places I read suggested that you use opened packages of dried coconut within 6 months at the latest. They also suggested keeping it in the fridge or freezer to make it last longer. Seeing as my sprinkles have been sitting around for over 10 months now, so I'm happy to say that you should be able to keep them for as long as you are comfortable keeping shredded dried coconut. I'll let you judge the optimal shelf life for yourself. In any case, I decided that my paleo sprinkles deserved a post of their own because they are great for so many things, and not just useful for making marshmallow peeps! natural food coloring make your own. Add a few drops of your homemade food coloring to some unsweetened coconut flakes and stir them well allowing them to absorb the coloring. Spread out the tinted coconut thinly on a baking sheet or a dehydrator tray. If using a dehydrator, follow the directions for your particular dehydrator to dry out the coconut so that you can safely store it again. If using a convection oven, set it to low temperature with the fan on, occasionally checking to see if the shredded coconut has fully dried. It's a good idea to stir it up and spread it out again to help move the process along and make sure that the coconut has fully dried. Store in closed containers, once fully dried, in a cool, dark place. We had a lot of fun with it. My son was helping me on and off- for as much as the attention span of a 4 year old at the time allows- but, yes, the process is very simple, even when you start by making the natural colorings. This is such an adorable idea! I love sprinkles and it’s been way too long since I have sprinkled anything! Thanks so much for the recipe and inspiration!